PETALS AND PATHS has a growing cadre of clients for whom the garden is their refuge from the stress and rush of the City. Each landscape we create is born of careful conversations where the focus is on creating garden spaces that become residential retreats for homes throughout the DC area and beyond. Every project starts with a conversation where we learn how the client would like to enjoy the outdoors. We find out how they live, play, relax; what colors, fragrances, plants resonate and draw on these evocative associations to inform the heart of the collaborative Design Process. These gardens are works of art, individually crafted and bring together lovely plantings, garden structures including pools, gazebos and full outdoor kitchens and spas; water features and fireplaces that become cherished gathering spots. The focus of PETALS AND PATHS is the home and so many of the area’s finest Custom Builders have used us to create high end landscapes for their clients. We also have a strong history of working successfully with Historic Preservation and HOA’s creating beautiful designs that bring praise for the sensitivity towards the complex issues involved. We create strong overall landscape design, detailing paths, pergolas, pools, and fountains. 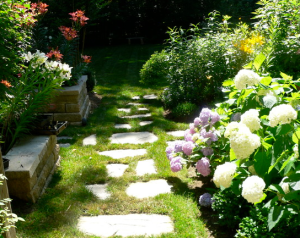 We excel in residential landscape design whether a small courtyard garden in Georgetown or an acre plus estate in Chevy Chase. Our design philosophy supports the principles of sustainable ‘GREEN DESIGN’; we use natural materials and choose plants that thrive.